Scientists in Michigan have found a new dwarf planet in our solar system. It's about 330 miles across and some 8.5 billion miles from the sun. It takes 1,100 years to complete one orbit. 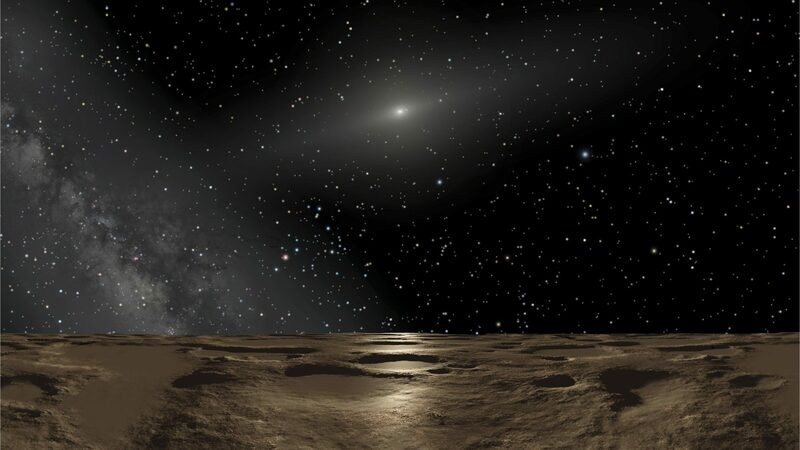 An artist's conception of the view from the dwarf planet Sedna. But one of the most interesting things about the new object, known for the time being as 2014 UZ224, is the way astronomers found it. David Gerdes of the University of Michigan led the team that found the new dwarf planet. Gerdes describes himself as "an adult-onset astronomer," having started his scientific career as a particle physicist. He helped develop a special camera called the Dark Energy Camera that the U.S. Department of Energy commissioned to make a map of distant galaxies. A few years ago, Gerdes had some undergraduates visiting him for the summer. He decided to give them a project: He asked them if they could find some solar system objects lurking in the galaxy map. How do you find solar system objects in pictures taken of the sky looking for galaxies? Well, you look for things that move: "Objects in the solar system, when you observe them at one instant and then a little while later, they appear to be in a different place in the sky," Gerdes says. Stars and galaxies are so far away, they're basically stationary. But a planet or asteroid will be in a slightly different position from night to night. It will appear as a dot of light that seems to be moving across the stationary backdrop of stars. Connect the dots night after night and you can begin to calculate the object's orbit around the sun. But the images Gerdes had from his galaxy map weren't taken night after night. "We often just have a single observation of the thing, on one night," he says. "And then two weeks later one observation, and then five nights later another observation, and four months later another observation. So the connecting-the-dots problem is much more challenging." But they were able to develop software that can do just that. The dwarf planet that Gerdes and his colleagues have found isn't the first distant dwarf planet astronomers have found in recent years. Sedna, Eris and Makemake have all been discovered in the past decade or so. Add to that Pluto, which used to be a planet until it was demoted when the definition changed. It's also possible some astronomers might argue that the object Gerdes found is too small to be considered a dwarf planet, but for now, he says the term applies. This new dwarf planet is pretty exciting if you're into dwarf planets, but there's a much bigger prize astronomers are searching for. They think there's a planet 10 times more massive than Earth hiding in the outer reaches of the solar system. A scientific paper earlier this year described the orbit of this so-called Planet Nine. Astronomers have since been scouring the parts of sky where the orbit says Planet Nine might be, but so far, no one has seen it. Gerdes says it's quite possible that one of the images taken for his galaxy map may actually contain a picture of it. "I'm excited about our chances of finding it," he told me when we me last month in a conference room along with several of his student collaborators. I asked him if "our" meant him and his team, or astronomers in general. "I'm excited about the chances of the people in this room finding it. Of course I'm happy for humanity if someone else finds it, it would be the most exciting astronomical discovery in our lifetime, I think." See more on WBur News.